A novel portable step-frequency radar system designed for the inspection of structural building elements such as beams, columns and walls is described. The radar operating in the frequency band of 1.9 GHz to 6.6 GHz has been built using the popular homodyne scheme that includes voltage-controlled oscillator, directional coupler, microwave mixer, transmitting and receiving antenna arrays. Four transmitting and eight receiving antennas connected through the SP4T microwave switches collect both co- and cross-polarized reflected signals. Tapered-slot Vivaldi antennas fed by the Marchand baluns had been chosen for the antenna system due to low level of clutter caused by unwanted interactions between the antenna and the wall surface. Besides, low weight of printed Vivaldi antennas is of great importance in the portable radar. The received data in discrete form are transferred to the notebook computer that performs data processing and creates image of the internal structure of the building construction. The data processing algorithm includes radar calibration, subtraction of the surface reflection and range profiling by the inverse discrete Fourier transform. The subtraction of the surface return helps to detect hidden objects placed in close proximity to the surface. Otherwise, they can be obscured by strong neighboring surface peak. The subtraction procedure was found to be very effective especially for the tapered-slot Vivaldi antennas with flares covered by resistive films. From the analysis of the obtained images, one can determine positions and depths of subsurface inclusions. The wall thickness can be evaluated as well. During the last decades, the application of microwave methods for non-destructive testing (NDT) of material properties and internal structure of building constructions has increased considerably [1-2]. Subsurface imaging is one of the most important NDT subjects because of the great demand to evaluate condition of walls, roads and bridge decks etc. The ability to detect and assess structure deterioration is important to decide whether the object rehabilitation or replacement is needed. The radar technique, also known as ground penetrating radar (GPR), had been always considered as a helpful tool for this task. In the GPR, there exist two distinct technologies, namely pulse or impulse radar and stepped-frequency continuous wave (SFCW) radar. While the latter technique has been investigated since 1970's, the pulse radar dominated in the GPR industry much longer. This was due to the high cost and complexity of SFCW GPR. Recently, the cost of microwave components has decreased considerably, making it more feasible to develop SFCW systems. In addition, the availability of fast, low cost digital signal processors has contributed to the growing interest in this implementation of subsurface radar. One of main disadvantages of the pulse radar is a complexity of obtaining high depth resolution that leads to poor visualization of thin concrete or brick walls. This can be explained by a dispersive nature of the wideband antennas and rather long tail of the real impulse. The SFCW radar is more flexible regarding the antenna choice due to possibility of the calibration of the radar that takes into account other hardware deficiencies as well . After the calibration, the first wall surface return can be effectively subtracted. Therefore, shallowly buried targets can be detected more reliably. Additional spatial measurements carried out over the wall surface allow simultaneous determination of the depth of inclusions and dielectric properties of the surrounding medium as is done in . The radar for the non-destructive inspection of building constructions should be portable, battery-supplied, light in weight and easy to handle. Fast data acquisition and data processing as well as the opportunity of storage of the information are also typical requirements for the devices of this kind. The portable radar has been developed using simple homodyne scheme that includes broadband voltage-controlled oscillator, directional coupler, microwave mixer, transmitting and receiving antenna arrays. The frequency of the oscillator is swept over the frequency range of operation using microcontroller signal converted to controlling voltage by a digital-to-analog converter. The selection of the frequency range is mainly dependant on the requirements of the penetration depth and resolution. For subsurface imaging applications in civil engineering, the penetration depth of 50 cm and range resolution better than 2 cm are desirable. We have chosen therefore the frequency range from 1.9 to 6.6 GHz corresponding to the range resolution of 1-1.5 cm in concrete. The electromagnetic waves from the oscillator through the directional coupler and the transmitting antenna array irradiate the inspected object. The reflected signal is received by the receiving antenna arrays. The broadband microwave mixer yields the output signal of the frequency that is proportional to the distance between the antenna array and the reflecting target. This signal is then filtered, amplified and converted to discrete form by an analog-to-digital converter integrated in the microcontroller ADmC812. The fabricated radar prototype is shown in Fig. 1. The radar consists of the transmitter and receiver (TR) unit, the antenna array, a portable computer, battery supply, telescopic holder and control unit. Three SP4T microwave switches are included in the antenna array to provide independent switching of four transmitting and eight receiving antennas to collect both co- and cross-polarized reflected signals. All the antennas are tapered-slot Vivaldi antennas fed by the Marchand baluns of the 4th order. They had been preferred for the antenna system due to low level of clutter caused by unwanted interactions between the antenna and the wall surface. For better performance in the near field, the tapered-slot antennas have corrugated edges covered by resistive mylar-based films. These low-profile light-weight printed antennas are very suitable for the hand-held instrument. The dimensions of the box containing antenna array and switches are of 28 cm to 11 cm to 15 cm while its weight is less than 1 kg. The antenna array box is attached to the TR unit. The necessary microwave connections are provided by two short semi-rigid cables seen in Fig. 1. Both the TR unit and the antenna array are equipped with two polyurethane wheels so that the antenna opening is elevated over the surface by approximately 1 cm. The telescopic holder with the length varying of 40 cm to 160 cm is attached to the TR unit. The whole system can be easily moved along horizontal or vertical surfaces of the inspected building construction. 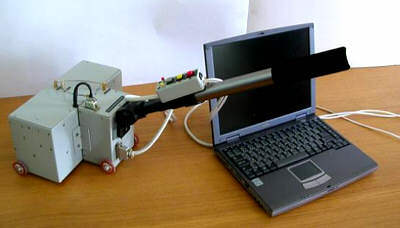 For easy operation, the TR unit is connected to the portable computer and battery supply by a cable as long as 5 m.
Fig 1: A portable step-frequency radar prototype for the inspection of building constructions. An optical encoder is included in the TR unit to ensure radar data collecting with the spatial separation of 2 cm independently on the radar velocity. To this end, its shaft is connected mechanically to the common shaft of the wheels. The control unit attached to the telescopic holder is used to start and stop data collecting. Besides, three buttons in the control unit are intended for controlling the format of the obtained image on the computer screen. 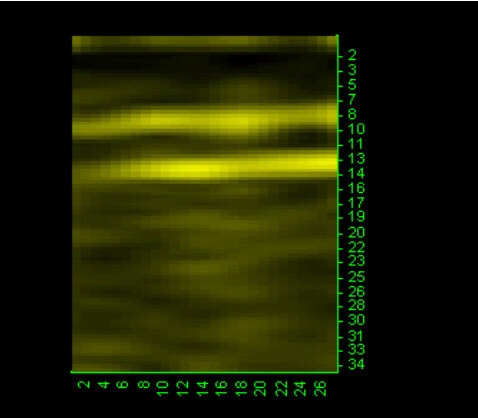 The data processing technique includes the following steps: radar calibration at each of operating frequencies (256 points over the full frequency range), subtraction of the wall surface reflection and range profiling by the inverse discrete Fourier transform. More complicated software for two-dimensional synthetic aperture focusing will be soon developed. However, this algorithm is time-consuming. For the calibration, a simplified version of the method described in  has been employed. In case the antenna has a long taper, the parameters of the error two-port can be derived from only one measurement of the metal plane reflection using the time domain filtering. The simplification was found to be acceptable at least for the tapered-slot antennas utilized in the radar. Experiments showed that the antenna dispersion and multiple reflections between antenna and wall surface are accounted well enough by the procedure that involves only free-space and metal plane calibration measurements. The subtraction of the surface return helps to detect hidden objects placed in close proximity to the surface. Otherwise, they can be obscured by strong neighboring surface peak. The subtraction procedure is based on a polynomial approximation of the frequency response of the radar after calibration, both in amplitude and phase. In most cases, the subtraction procedure eliminates the polynomial term representing the dominant response up to the level of surrounding clutter. To test the radar performance, a special concrete specimen with the thickness of 15 cm with artificial inclusions has been prepared. In the both examples, a single scan had been carried out and analyzed. Results of inspection of the concrete specimen with the cylindrical cavity and metal rod are shown in Fig. 2 and Fig. 3, respectively. The depth in the both cases was close to 7 cm. Fig 2: Image of the cavity in the concrete specimen (lower strip corresponds to the back side of the concrete slab). Fig 3: Image of the metal rod (diameter of 18 mm) inside the concrete specimen. In the both images, one can easily detect the inclusions and evaluate their depth. The level of clutter is low compared to impulse GPR. 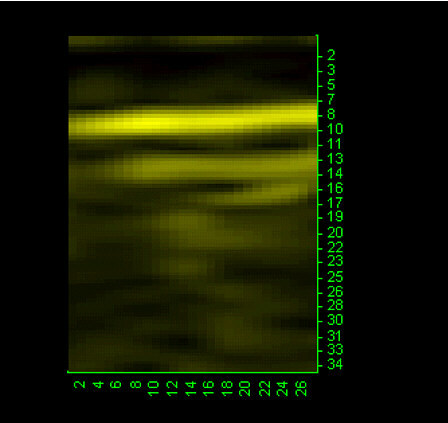 Unfortunately, the conventional Fourier data processing is not suitable to discriminate different objects, e.g. to distinguish voids and reinforcing bars. To this end, more complicated reconstructive analysis is needed. A prototype of the portable step-frequency radar for the application in civil engineering has been presented. Despite of the radar contains four-element transmitting and receiving antenna arrays, its dimensions and weight are low enough for practical use. Experimental verification showed good sensitivity of the radar to subsurface inhomogeneities while the level of clutter is low. In the future work, modern data processing algorithms such as synthetic aperture focusing and reconstructive imaging will be applied. U. Spagnolini and V. Rampa, "Multitarget detection/tracking for monostatic ground penetrating radar: application to pavement profiling," IEEE Trans. Geosci. Remote Sensing, 1999, vol. 37, No. 1, pp. 383-394. K. Bois, A. Benally, and R. Zoughi, "Microwave near-field reflection property analysis of concrete for material content determination," IEEE Trans. Instrum. Meas., 2000, vol. 49, No. 1, pp. 49-55. V. Mikhnev and P. Vainikainen, "Single reference near-field calibration procedure for step-frequency ground penetrating radar," IEEE Trans. Geosci. Remote Sensing, 2003, vol. 41, No.1, pp. 75-80. G. Deshchenko, "Step-frequency microwave testing of concrete walls," Proc. of the 7th European Conf. on Non-Destructive Testing, 26-29 May 1998, Copenhagen, pp. 868-871.